54992 SPE JAPAN (1983) Showa Memorial Park*. MIHON (specimen) overprint. Scott No 1552. 52540 SPE TAIWAN (1998) Kinmen National Park*. Set of 4. Scott Nos 3199-3202. 52625 SPE TAIWAN (2003) Chungsan Park*. Set of 4. Scott Nos 3513-6. 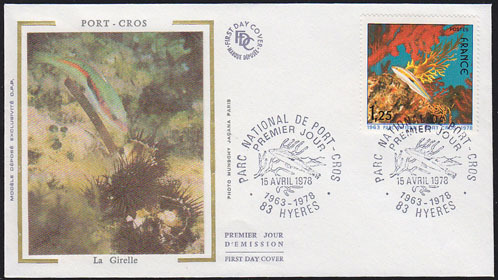 76049 FDC FRANCE (1978) Fish*. Corals*. Unaddressed FDC with cachet. Scott No 1605. Port Cros National Park. 54912 SPE JAPAN (1969) Mt. Iwo*. MIHON (specimen) overprint. Scott No 1007. 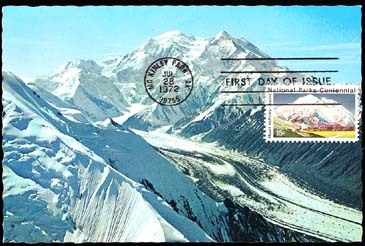 73077 MAX U.S.A. (1972) Mt McKinley (Denali)*. Maximum card with First Day cancel. Scott No 1454, Yvert No 954.